Human Rights Watch urged police to show restraint in the face of protests. A man throws a stone towards police in Kibera, Nairobi, Kenya, as people block roads with stones to protest in support of Kenyan opposition leader and presidential candidate Raila Odinga. TWO PEOPLE HAVE been shot dead in Kenya in angry opposition protests which flared up again after the hotly disputed election victory of President Uhuru Kenyatta. Protests and running battles with police broke out in Nairobi slums after a night of anger in opposition strongholds against an election that losing candidate Raila Odinga claims was massively rigged. East Africa’s richest economy was gripped by uncertainty a decade after a disputed 2007 election which led to two months of ethno-political violence that left 1,100 dead and 600,000 displaced. All eyes will now turn to Odinga, and his reaction to the loss which he claimed was a result of massive rigging of Tuesday’s election, which his party denounced as a “charade” and a “disaster”. Odinga has yet to speak after the results were announced, but almost immediate protests erupted last night in his strongholds in western Kisumu county and poor areas of Nairobi, with gunshots ringing out and fires lit in the streets. “We have one person killed and four others admitted in hospital with gunshot injuries,” said Dr Ojwang Lusi, the regional health chief in western Kisumu county. “My brother was shot and yet he was just standing outside our house where people were demonstrating now he has a bullet injury on the hip,” said Truphena Achieng, at a Kisumu hospital. Meanwhile protests flared up again this morning, with police firing teargas and engaging in running battles with demonstrators in the capital’s Mathare and Kibera slums, according to AFP reporters. In Kisumu protesters blocked major highways around the city. 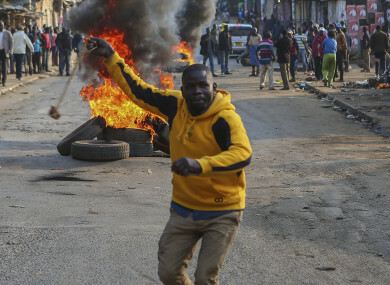 “With growing reports of demonstrations and heavy gunfire in some areas, it is important for security forces to work to deescalate – not escalate – the violence,” said Otsieno Namwaya, Africa researcher at HRW. Email “Two shot dead in protests over disputed Kenyan election”. Feedback on “Two shot dead in protests over disputed Kenyan election”.